Are you gearing up for your New Year’s resolutions along with the rest of America? No matter how good I’m doing with workouts and eats and life in general, I always make a few New Year’s goals. It’s just so nice to have a fresh start in a new year, isn’t it? A clean slate. Adding one more year is always a weird reminder that time is definitely passing and that you should grab life by the horns! So consider 2014 a time to kick bad habits to the curb and embrace winning ones. This list from Nexercise is a great reminder that will help you wrap your mind around some lifestyle tweaks you can easily make in the new year if you shift your thinking. 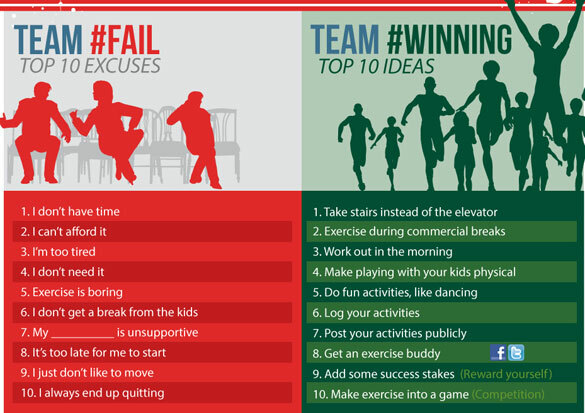 So go ahead, kick these 10 excuses to the curb, and instead, embrace these 10 winning ideas! This is a good question! I am going to try to have fewer sweets and fewer crackers this year. I am limit the sweets and crackers for my kids, but I need to do a better job of doing that for me. I am going to start eating like I feed them. If I don’t want to give them some crackers or sweets then I shouldn’t have any either. Wish me luck! !